Supported by a local Friends chapter and surrounded by rural countryside and the Chattahoochee National Forest, this quiet park in northwest Georgia offers outstanding fishing on two stocked lakes. Visitors can hike along three miles of lake loop trails and relax in swings while watching for the many bluebirds that live in the park. The trailhead to the scenic 60-mile Pinhoti Trail is only a 1.6-mile hike away. Children especially enjoy the playground, feeding ducks from the lake’s boardwalk and renting pedal boats. A small campground and four cottages are nestled on tree-covered hillsides. This park was named for Rep. James H. “Sloppy” Floyd who served in the Georgia House of Representatives from 1953 until 1974. Our November spotlight is shining on Friends of Sloppy Floyd. 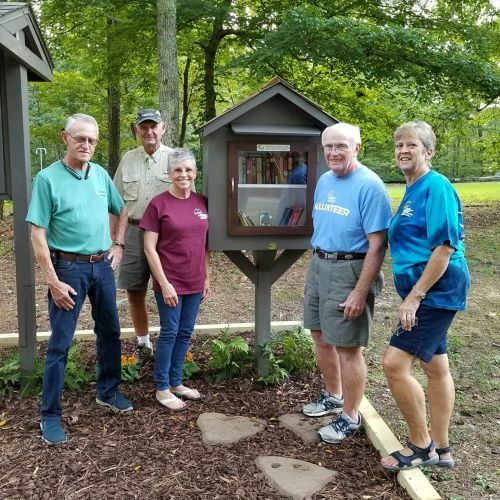 This group of remarkable volunteers put their hearts and souls in to taking care of their park, James H. “Sloppy” Floyd State Park, in Summerville, Ga. They are a small but powerful group of volunteers. For a full listing of events and information about James H. (Sloppy) Floyd State Park Historic Park visit the Georgia State Parks page.